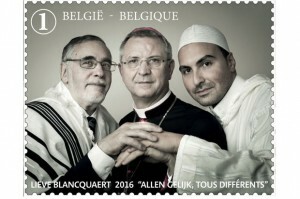 They could not know about the symbolic power of their idea, when the Belgian Post announced early November 2015 the release of new stamp called “Tolerance” in 2016. It will show three key religious leaders including the country’s chief rabbi Albert Guigui, Imam Khalid Benhaddou from Ghent and the Bishop of Antwerp Johan Bonny. The stamp will carry the slogan “Everybody equal, everybody different”, aiming at promoting unity and tolerance. Both appear to be more needed than ever before. 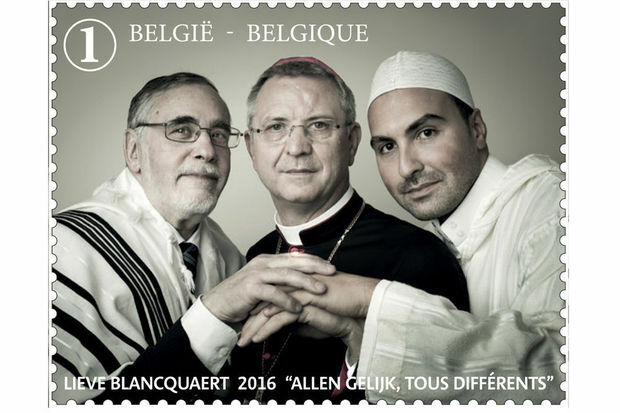 “The stamp is meant to show that in Belgium, despite what is happening and what people hear in the news, there are good relations between faiths. The photo shows us holding hands, united and working together,” Guigui said in an interview with the The Times of Israel beginning of November – before the Paris attacks. He is 70 years old and has been chief rabbi of Belgium for the past 30 years. Bpost and everyone involved in the project had all good hopes that a stamp can help in promoting tolerance. And in fact, in many countries or regions, where we find a good mix of religious groups, not only their coexistence but also their interaction works well. “Issues occur often there, where diversity is low, not visible or where people are not aware of it”, Diversity expert, Michael Stuber, observes. He points to many studies that show that different forms of xenophobia and –isms tend to be more prevalent in areas where people are not or little exposed to the differences in question. Guigui pointed in the same direction when stating in his interview “When people start to know and speak with one another, there is less fear”. The idea of the stamp was developed in the aftermath of a shooting attack on the Jewish Museum in Brussels in May 2014 in which four people died. The Jewish community in Belgium has approximately 40,000 members and splits mainly between Brussels and Antwerp. It has suffered a rising number of anti-Semitic attacks in recent years, which appeared to be related to Israel’s conflicts with Gaza – as in other countries (c.f. this article on anti-semitism in Europe). The Muslim Community has an estimated 700,000 to 900,000 members; they cover more than 25% of the Brussels population and have large communities in Antwerp and Charleroi. Most Belgian Muslims have Moroccan roots. In a 2006 poll, a majority of the Belgian population was found to thing that tensions between Muslims and other communities would increase in the future. The stamp depicting the three clergymen dressed in their respective faith’s traditional garb will officially be released in October 2016. However, a much stronger united push from religious and atheist communities will be required to address the international terrorist tendencies of recent weeks.